Time to get personal, huh? Well, here you go! Just the facts man. • I enjoy talking in funny voices and singing LOUD. • Children think I am one of them. • Strangers like to tell me their deepest secrets. • I sang at Carnegie Hall. It took 10 years photographing children to realize the reason I enjoyed it so much was because after all the producing, scheduling, marketing, and administrative work, I literally got to PLAY on set! There are many advantages to being an adult, like eating what you want, when you want… and iced lattes! But its not always acceptable to talk in funny voices, get loud, make up and sing silly songs, or jump around. On set was the only place I had found comfort in being a full expression of myself. It just so happened, I was on a photo job caring on in conversation, that the videographer on the shoot stopped me in mid sentence to say with much enthusiasm, “You have a GREAT girly voice! 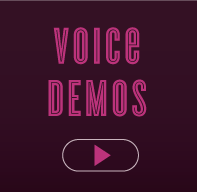 Have you ever thought about doing voice over?” I hadn’t! But was then! It was through my experience as a photographer that I knew the power of my own voice to evoke an emotion through story telling tied with changing the range or cadence. That one conversation changed the course of my career and I get to discover more and more what I am capable of. You just never know!